How to pop a pimple? Everything you read online probably tells you to never, ever pop a pimple because it’ll actually make acne worse. What many of these articles mean is that if you don’t know how to pop a pimple, you should never do it because you will make things worse. It is a common myth that you should never pop your pimples, but like all myths, there’s a kernel of truth to it. If you have acne and you’re dying to pop your pimples, you’ll want to read this article first. It will describe the different types of acne and which ones are safe to pop, explain the risks involved in pimple popping, offer a guide for how to pop a pimple safely, and answer some frequently asked questions. Before you pop anything, it’s important to know what kind of acne you’re dealing with. Blackheads and Whiteheads and Pimples, Oh My! Okay, there are actually more types of acne than blackheads, whiteheads, and pimples. There are five main kinds of acne: blackheads, whiteheads, papules, pustules, and cysts. You may have noticed that pimple isn’t even in there at all—or is it? A pimple and a pustule are actually the same thing: a clogged, inflamed pore containing pus under the skin. This is the only kind of acne you should ever try to pop. In order for you to know what kind of acne you are allowed to pop, you also have to know a little about the acne you shouldn’t pop. Another common acne myth is that blackheads are caused by dirt clogging an open pore. In reality, acne has nothing to do with dirt, and trying to scrub blackheads away could actually turn them into whiteheads. Blackheads are just open pores that are clogged with excess skin oil, also called sebum, and dead skin cells. It only turns dark because of how it interacts with the air. Although it can be tempting to pop these and squeeze out the sebum and skin cells clogging the pore, you will likely also squeeze out the healthy sebum in the pore, leaving it unprotected against acne-causing bacteria. Unlike popping a pimple, popping a blackhead really can make acne worse. Whiteheads are a lot like blackheads; they are caused by sebum and dead skin cells clogging a pore. This pore, however, is not open to the air. Instead, a thin layer of skin has grown over the clogged pore, leaving a small white bump. If you know how to pop a pimple, you can see why popping a whitehead is also a very bad idea. In order to pop it, you’ll have to break the skin, which can lead to scarring. You might be unfamiliar with the term “papule” but if you have acne, you have probably had papules. 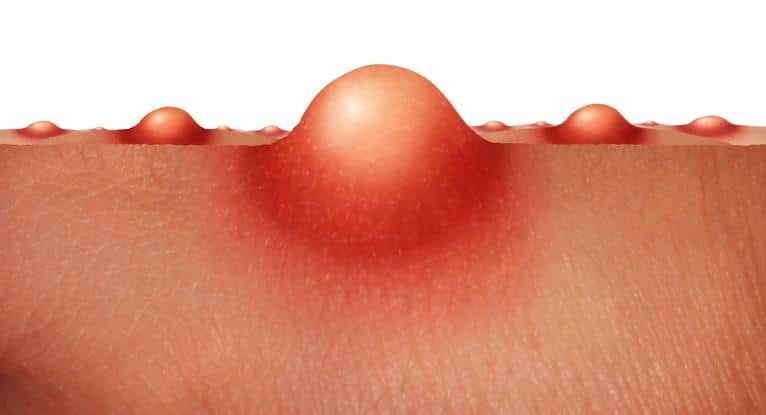 These are the bumps that are more raised than a whitehead, probably with more redness, and less of a defined “head.” Unlike blackheads and whiteheads, which are just clogged pores, a papule is a clogged pore that’s been affected by p. acnes, the bacteria that contributes to acne. Even though these are larger and often more noticeable, you definitely don’t want to pop them. In a minute we’ll go through how acne and your immune system interact, but for now just know that trying to pop a papule can actually help bacteria grow under your skin. These are pimples: raised, inflamed pores with a yellow-ish head containing pus. Most papules become pustules when the immune system fights the bacteria under the skin and creates pus, but more on that in a moment. These are the only kind of acne you should ever try to pop, and even then you should do so with caution or the help of a dermatologist. Cysts are large, raised lesions on the skin, significantly larger than one single pore, often containing pus. Cysts develop when your immune system and p. acnes get into a drawn out fight that makes the site of infection spread deeper and to a larger area. Even though cysts contain pus like pimples, you should never pop these, even if you know how to pop a pimple properly. Popping a cyst can lead to significant scarring, and could make the infection worse. Acnes bacteria always live on our skin, and in reasonable numbers, they can help us in some ways. They use sebum as a food source, so they can cut down on excess oil, and they excrete acids that can be good for our skin. When they are present in large numbers, however, they can be very tricky to treat. This is because of two main factors: they are anaerobic, and they can take advantage of our immune system. Anaerobic means that they cannot survive in oxygen. Instead, they burrow into our pores that are clogged with sebum, and with all that extra food, they can reproduce quickly and create a minor infection. When the immune system detects this growth of bacteria, it triggers the inflammatory response. This is when our bodies send extra blood to the site of an infection, which helps in two ways. First, increased blood flow can cause swelling, which cuts off any air that would help (most) bacteria grow. This swelling is what leads to papules. Even though swelling doesn’t help fight p. acnes, the other effect of increased blood flow does. The blood transports bacteria fighting agents, like macrophages or t cells, to the site of the infection, so more blood means more fire power. Typically, these cells kill the bacteria and often themselves in the process, which creates a byproduct called pus. That’s when you get a pimple. This doesn’t always happen though, because p. acnes can release chemicals that trick our immune system into fighting our own skin cells. This allows the infection to spread and results in cystic acne. Certain people are naturally more prone to cysts, but if you don’t know how to pop a pimple and accidentally try to pop a papule, you could also run into this problem. So why is it okay to pop pimples, but not papules? How do I know it’s time to pop? You should never pop a pimple until it is truly a pimple, with pus that creates a yellow head. 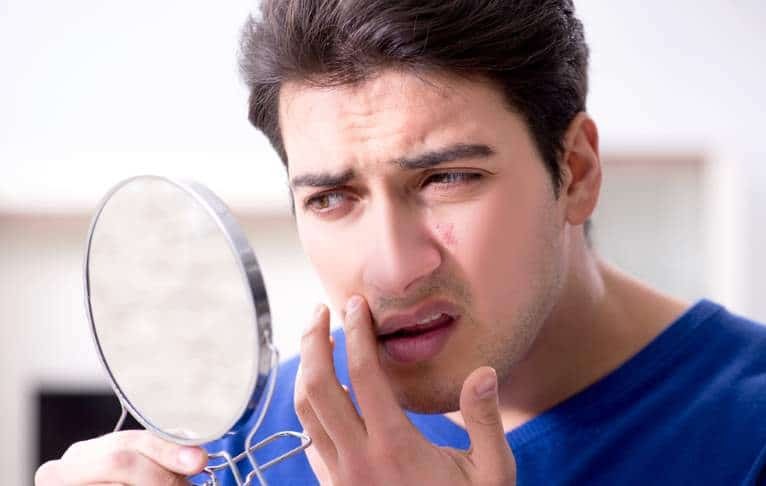 Trying to pop pimples when they’re still really papules can lead to even more issues. A pimple is only ready to be popped when it has a yellow head. When you push and squeeze on a papule, the pressure could send the bacteria deeper into the skin, or it could cause them to release the chemical that tricks the immune system. This makes the infection larger and last longer, which is what many articles mean when they say popping a pimple can make acne worse. Popping acne before it’s ready can create more problems. If your acne does not have a yellow head, it is not time to pop it. You may be wondering why the yellow head makes such a difference. Won’t squeezing a pimple affect the bacteria too? The simple answer is no, because the bacteria are largely dead at that point. As we discussed earlier, pus is created when your immune system fighters and the bacteria both die. When there’s enough pus to form a head, the vast majority of bacteria have been taken care of, so popping will not cause any of the issues that often arise when trying to pop a papule. Instead, popping can relieve pressure created by the swelling and pus, which could prevent scarring. A popular myth is that popping pimples will create scars, but if you know how to pop a pimple, this isn’t true. The body has no use for pus, so it will find a way to expel it on its own if the pimple isn’t popped. Left un-popped, pimples often rupture, and this rupture could lead to more of a scar than if a pimple is popped responsibly. Post-inflammatory hyperpigmentation (PIH, or just hyperpigmentation) is when a spot on the skin temporarily takes on a darker shade, typically after acne lesions heal. Part of the skin’s healing process is releasing extra melanin, which can give the newly healed area a darker pigment. Unlike scars, hyperpigmentation isn’t permanent, but it can last several months or even years. If you know how to pop a pimple, you will likely not leave a scar, but hyperpigmentation is still a distinct possibility. However, this is also a possibility if you let the pimple rupture itself, so the only way to get rid of a pimple and avoid hyperpigmentation is if the pus naturally recedes in the body. This does sometimes happen, and may be the strongest reasoning for not popping pimples. If you’re currently a pimple popper, the next time you get a pimple, try to wait it out and see if your skin will deal with the pus on its own. Although hyperpigmentation can happen in all skin types, it is much more common in people with dark skin. These dark spots also tend to last longer with dark skin, and the products or procedures often used to reduce hyperpigmentation may have adverse effects if not used or done properly. When used together and only on the affected spots, hydroquinone and a retinoid can reduce hyperpigmentation in people of color without going too far in the other direction and creating light spots. Chemical peels and laser therapies are also an option for all skin types—if the doctor knows what they’re doing. If you have dark skin, it may help to ask the doctor how many people of color they’ve treated in the past. If they’ve only worked with white people, they may not be qualified to treat your skin and keep it healthy. Okay, so knowing how to pop a pimple could actually be good for your skin, or at the very least, isn’t as terrible as everyone says it is. But there is still one bad skincare habit to avoid: do your best not to scratch or pick at your acne. Unlike properly popping a pimple, scratching and picking can cause irritation, and when the skin is irritated, it produces more sebum. This sebum then clogs pores and leads to more acne. Scratching or picking at acne can harm your skin and actually make acne worse. Another potential danger with scratching and picking is increased scarring and hyperpigmentation. If you don’t know how to pop a pimple responsibly, or if you absentmindedly pick and scratch, you could tear the skin open, leaving a much bigger problem for the skin to heal. This will almost definitely lead to hyperpigmentation, and it could also produce a scar. If you are going to take care of your acne yourself, it’s important to know how to pop a pimple without causing more issues. If you have a clearly defined pimple filled with pus and ready to pop, then you’re ready to learn how to pop a pimple. The next things you’ll need are rubbing alcohol, a cotton ball, and a sharp needle. A fine sewing needle usually works best. Saturate the cotton ball with rubbing alcohol, then wipe down the needle. Next comes the gross part (or the cool part if you’re into that kind of thing). Gently use the needle to prick the yellow head of the pimple. There’s no need to stab yourself or force the needle in deep, just barely break the skin. Set the needle aside and get your tissues. Wrap each index finger in a tissue; this will prevent any bacteria on your fingers from getting under your skin and causing another infection. Place one finger on either side of the pimple and gently (one of the most important aspects of how to pop a pimple is to do everything gently) press down and in. This should guide some of the pus out of the opening you created with the sterilized needle. However, if no pus comes out, do not force it. Listen to your skin; if it isn’t ready, it isn’t ready. Forcing things can cause scarring. If pus does come out, and you can see that there’s no more yellow under your skin, stop pressing. Even if you do see more yellow under your skin, you should still stop pressing if blood or clear fluid starts to come out. Once you’ve popped the pimple, whether you think it’s fully popped or not, step away. Do not continue to press or pick, as this can lead to hyperpigmentation or scarring. Now you can officially say you know how to pop a pimple safely! But even though you can technically pop pimples, you should still avoid it whenever possible. The best way to do this is to prevent acne. When you treat acne, you start at a disadvantage. The pores are already clogged, the bacteria are already colonizing, and you’re just trying to catch up. Although acne treatment is important, if you can find a routine that reliably prevents acne, that’s even better. There are a million acne products claiming to be the best treatment for blackheads, or the best product for oily skin, but the truth about acne prevention is that almost all acne can be prevented with a gentle, consistent skincare system. Many acne products are more aggressive than gentle, because they want to generate immediate results. This isn’t best for your skin in the long run, though. Instead, look for a well-balanced system that cleanses, clears, and moisturizes. Most acne can improve with a gentle, consistent skincare system. We recommend Exposed Skincare, because they use a low concentration of benzoyl peroxide, salicylic acid, and other proven acne treatment active ingredients, alongside natural ingredients that keep skin healthy and moisturized, like green tea, sage extract, and aloe vera. This combination works for all skin types because it’s strong enough to fight acne but gentle enough not to fight your skin. It is one of the few products that aim to be a long-term solution than a short-term “miracle” cure. I don’t love needles, but I want my pimples popped—is there any way my dermatologist could pop my pimples for me? Yes! Although many dermatologists caution their patients about popping pimples, this is largely to prevent premature, unsanitary, or overly aggressive popping. Most dermatologists know how to pop a pimple safely, and they also know many of their patients are going to pop their pimples no matter what they say, so some dermatologist offices offer pimple popping services. Even if you are a pro, you might want to see a dermatologist because they can help get rid of acne that you should never try to pop at home, like blackheads or cysts. Blackheads and whiteheads shouldn’t be popped at home, but through a process called extraction, dermatologists can help unclog pores. Cysts can also be safely treated by a dermatologist, through an incision and drainage procedure or a corticosteroid shot. The incision and drainage is somewhat similar to our pimple popping method, but it’s more sterile, more controlled, and most importantly, performed by a doctor who knows how to treat cysts properly. Never try to lance a cyst at home; it will almost definitely lead to scarring and could spread infection. The corticosteroid shot can reduce inflammation almost instantly, which can help prevent the scarring common to cystic acne. Are there any ways to make pimples less noticeable without popping? Definitely. 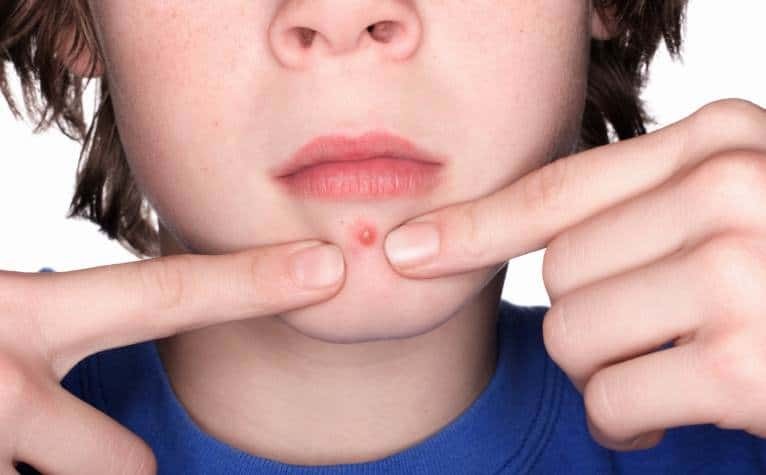 No other treatment can remove the pus under the skin of a pimple, but there are spot treatments that can quickly reduce redness and inflammation, and make pimples less noticeable. One popular spot treatment right now is tea tree oil. This essential oil is powerful, so it should always be used only as a spot treatment rather than over the full face. It has powerful anti-inflammatory and bacteria fighting properties, so it can reduce the redness of a full-blown pimple and fight any bacteria surrounding it. Simply saturate a cotton ball or Q-tip with tea tree oil, and apply it to the affected area once a day. Another potential spot treatment is an everyday kitchen item: ice. If you’ve ever had a sports injury, you know that ice can reduce pain and swelling, and those same principles apply for pimples. Place one ice cube in a plastic baggie and press it gently to the pimple for 5 minutes. If you do this twice a day, the ice should help reduce swelling and redness, making the pimple less noticeable. If my dermatologist told me not to pop my pimples, can I pop them if I do so safely? Even though it is largely a myth that you shouldn’t pop your pimples, you should always listen to your doctor first. If you know how to pop a pimple and feel confident you could do so appropriately, tell your doctor that and see what they say. Never do something your doctor expressly told you not to do without checking with them first. hi my name is Karenza and unfortunity i squeeze pimples and black heads i started when i was 10 and know i am 11 also i don't know how to stop and my face is a mess with pimples please help me try to stop because i get imbarissed when people look at me please help . Hi im a 46 year old woman and i get pimples every week and i pop them because it just looks bad but i dont know what to do....i need suggestions!!!! Hi. I've suffered from acne since I was in my teens (I'm now 32!) I have a recent flare up, despite taking the pill, Yasmin (which is supposed to help); I have tetracycline antibiotics; the use of a heat lamp and Differin topical gel - none of these preventative measures are making any difference! Any help would be greatly received!